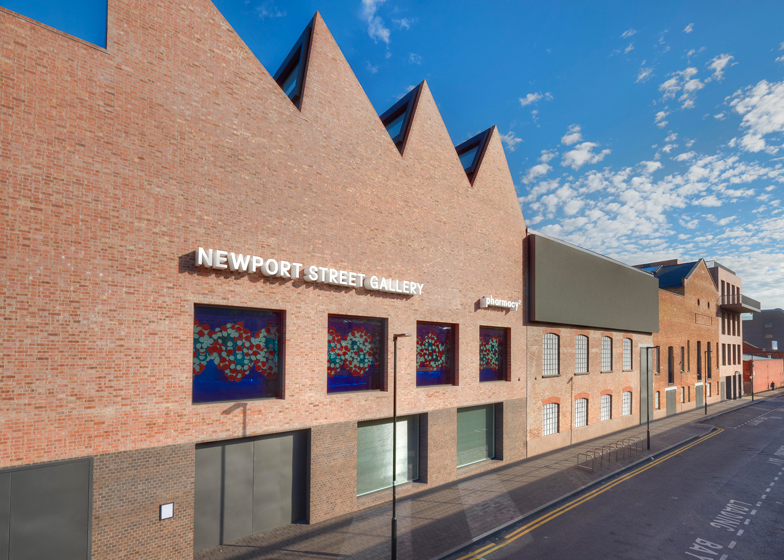 Images have emerged of Damien Hirst's Newport Street Gallery – designed by London architecture studio Caruso St John in a row of converted and extended theatre warehouses. The Newport Street Gallery, due to open on 8 October 2015, occupies a string of former industrial and purpose-built buildings. It stretches along a street in Vauxhall, south London, and will be free for the public to visit. The 3,400-square-metre gallery houses over 3,000 pieces of art from the British artist's personal collection, including pieces by Francis Bacon and Jeff Koons, which will be displayed in a series of exhibition spaces over two levels. Spiral staircases with walls made from white engineered brick provide connections between the floors. Caruso St John – the studio behind the renovation of London's Tate Britain, the Gagosian Paris, and the Nottingham Contemporary art centre – has renovated three listed buildings and added two new structures, one at each end of the row. Caruso St John's additions use similar proportions and materials to the existing brick buildings, which were purpose built in 1913 for theatre carpentry and scenery production. Inside, floors have been taken out to open up the spaces, creating high-ceilinged galleries and making room for offices. The roof of the tallest of the buildings has been designed to enable the installation of large sculptures. The gallery will also include a shop and a cafe. Plans for the building were first announced in 2012, but the original 2014 opening date was pushed back to this year. Newport Street Gallery's inaugural exhibition will be dedicated to the work of Sheffield-born abstract painter John Hoyland, who rose to prominence in the 1960s and 1970s. The show will focus on his painting from 1964 to 1982, and take over all six of the building's gallery spaces. Hirst is known for his visceral approach to art, with pieces including pickled animals and jewelled skulls. He rose to fame in the 1990s as part of the UK's group of Young British Artists, which also included Tracey Emin and Sarah Lucas. Newport Street is not his first architectural commission. In 2013 UK studio Designscape Architect completed two buildings for the artist near his studio in Stroud, Gloucestershire – an art production studio that appears to change colour from blue to green and a glazed brick building designed for using toxic chemicals. In 2012 Hirst also announced plans to build a 500-home eco-development in Devon, south England. For job opportunities at Caruso St John Architects, visit their company profile on Dezeen Jobs. Photography is by Prudence Cuming Associates, unless otherwise stated. All images courtesy of Kioyar Ltd.